Work is required to strengthen the piers, beams, foundations and install new bearings. The Cairngorm funicular railway is to remain out of operation throughout the summer after safety concerns were raised. A full investigation was commissioned by owners Highlands and Islands Enterprise (HIE) following a general inspection which forced its closure in the autumn. Engineers have now concluded that a series of measures need to be put in place before service can resume. Work is required to strengthen the piers, beams and foundations, and install new bearings with higher load and movement capacity. Susan Smith, HIE's head of business development, said: "We have considered carefully the implications of the investigation and concluded it will take considerable time to design, procure and complete the necessary works. "Our goal is to have the funicular up and running as soon as is safe to do so, but in the meantime, we anticipate it will remain out of service throughout the summer months and possibly beyond." 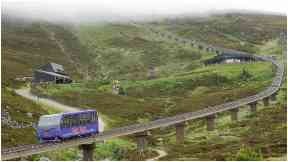 CairnGorm Mountain Ltd (CMSL), which operates the railway, said there would still be much to offer summer visitors. Ross Harris, interim chief executive of CMSL, said: "Cairngorm Mountain is an outstanding all year-round tourist attraction. The funicular is of course a unique feature of Cairngorm, but there is so much more to experience. "We are working hard to ensure that we continue to provide the best experience possible for our snowsports customers who can access the mountain using our network of tows and we are confident we can build on an already attractive offering for our summer visitors. "We are focused on making Cairngorm Mountain a 'must-visit' destination because we know that in doing so the resort will continue to provide economic benefits for the entire Strathspey area for years to come."